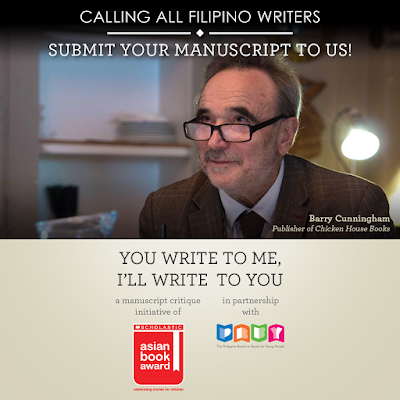 In partnership with the Philippine Board on Books for Young People (PBBY), You Write to Me, I'll Write to You is a manuscript critique initiative of the Scholastic Asian Book Award (SABA) in an effort to further encourage and inspire Asian writers. The manuscript critique initiative aspires to motivate writers while assisting them to get their manuscript in shape and recognizing excellence in Asian writings. A total of six entries (the brief synopses and opening pages of six manuscripts) will be shortlisted to receive a review and written feedback from Mr. Cunningham, and only the most outstanding entry from the shortlist will receive a review of the complete manuscript. “The birth of this idea came from the Scholastic Asian Book Award (SABA) and we hope that through this initiative, more Filipino writers in Asia will submit their manuscripts to the SABA and stand a chance to get their work published,” she added. Mr. Cunningham, who is the Publisher of Chicken House Books - home of great reading - has had an impressive career in publishing. He has worked with all the great names in children's books including Roald Dahl and became one of the best-known names in publishing after he signed up J.K. Rowling's Harry Potter and the Philosopher's Stone. You Write to Me, I’ll Write to You is open to all Filipino writers living in Asia, who are 18 years of age and above. Manuscripts submitted must be chapter books or novels intended for children to young adults between 6 and 18 years old, and must be Asian in content. The closing date for all submission entries is April 30, 2017, 5:00 p.m. (Philippines time). For more information on how to enter, visit scholastic.asia/youwritetome.